Interagency coordination occurs between DOD and other USG departments and agencies, as well as with private-sector entities, nongovernmental organizations, and critical infrastructure activities, for the purpose of accomplishing national objectives. Many of these objectives require the combined and coordinated use of the diplomatic, informational, military, and economic instruments of national power. Due to their forward presence, the Combatant Commands (CCMDs) are well situated to coordinate activities with elements of the USG, regional organizations, foreign forces, and host nations. In order to accomplish this function, the GCCs have established JIACGs as part of their normal staff structures. Faced with challenges to national interests, the United States, along with its multinational partners, can respond by using the capabilities resident in one or more of the instruments of national power (diplomatic, informational, military, and economic). A strategic, top-down approach aligns and harmonizes a variety of ways and means with a set of desired strategic ends. These ends provide the fundamental purpose and context for committing the military and other instruments of national power. The crux of interorganizational coordination is in understanding the civil-military relationship as collaborative rather than competitive. The most productive way to look at this relationship is seeing the comparative advantages of each of the two communities—military and civilian. While the military normally focuses on reaching clearly defined and measurable objectives within given timelines under a C2 structure, civilian organizations are concerned with fulfilling changeable political, economic, social, and humanitarian interests using dialogue, bargaining, risk taking, and consensus building. Civilian organizations may have a better appreciation of the political-social¬cultural situation, and have better relief, development, and public administration. They may be more adept at negotiation, bargaining, and consensus decision making, thus potentially acting as agents of change within that society. When campaign planning, deliberate planning, or crisis action planning (CAP) is required, the degree to which military and civilian components can be integrated and harmonized will bear directly on its efficiency and success. To the extent feasible, joint planning should include key participants from the outset. The CCDR, through his strategic concept, works with the engaged civilian organizations to build annex V (Interagency Coordination) of the joint operation plan. Subordinate JFCs also build civilian organization participation into their OPLAN, and increasingly, participate in integrated civil-military campaign planning with the embassy. 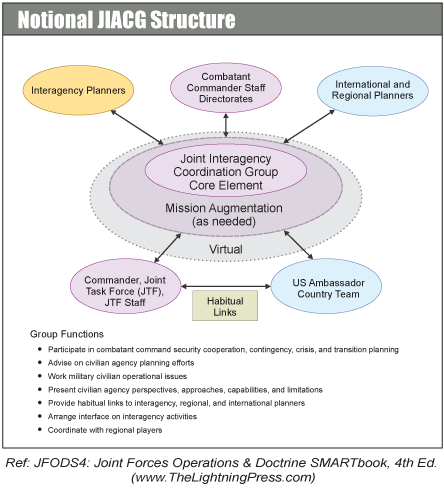 Within the area of responsibility (AOR) and the joint operations area (JOA), appropriate decision-making structures are established at combatant command, joint task force (JTF) HQ, and tactical levels in order to coordinate and resolve military, political, humanitarian, and other issues. Joint and multinational operations against contemporary adversaries or supporting civil authorities during catastrophic disasters require unified action in planning and execution with interagency and multinational partners who are not under US military command authority. This effort depends on building and sharing a common understanding of the strategic purpose and end state; developing relevant objectives; a common understanding of the operational environment; and harmonization of the actions required to resolve the problem. Increased and efficient organizational cooperation between and among the myriad organizations performing their roles to achieve national strategic objectives is essential. Challenges to effective interagency coordination caused by partners having conflicting policies and procedures further complicates efforts at achieving unity of effort. Typically, each agency develops its own agency-specific plans at varying levels of detail in response to an issue or event. The challenge to the interagency community is to take single agency planning efforts and meld them into a collaborative, multiagency planning process that exploits the core competencies of all the interagency partners.